The first signs of melanoma are changes in moles. It makes sense to at least know how many moles you have and be aware how they look and how big they are. Knowing what visible signs or symptoms to look out for in your moles is the first step to prevention of melanoma. Melanoma should not be taken for granted because it is the most serious and the deadliest among the 3 types of skin cancer. What are the 3 crucial melanoma signs? What are the symptoms of malignant melanoma skin cancer? Moles are important symptoms. Whether the moles are cancerous or not is based on 4 signs called the ABCD of moles. This pertains to the shape of your moles. If they are abnormal moles, their shape is not balanced. One side doesn't match the other side. 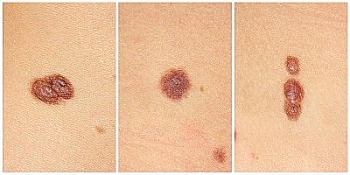 The outline of abnormal moles is irregular, uneven or blurred. Their color spill over to the dermis surrounding the moles. Color is also not balanced. If the abnormal mole is black, you can see shades of other colors such as brown, pink, tan, white or blue. The moles may get bigger in size if they're cancerous. The normal size is that of the eraser of a pencil. If it becomes larger than this, it is one of the sure signs of skin tumor. Do all the signs of melanoma have the ABCD features? Most symptoms do and some signs may only have one or two of the ABCD features. Prevention and detection of early melanoma is possible if you know what changes in your skin to look out for. Unusual changes include . . .
What are signs of advanced melanoma? These are symptoms of advanced-stage melanoma. Why is it important to detect signs of melanoma at its early stage? Survival rate is very good as it can be cured as long as the tumor is still thin and has not spread deep into the skin. Skin cancer is also the easiest to detect as long as you know what causes it.